Jimmy Cochran’s art really comes to life when it is on the street, there’s a piece just around the corner from Lollipop Gallery, a piece in a wall on the side of a cafe in Fashion Street (just off Brick Lane), a piece looking straight down the street in amongst the furniture, the traffic signs, the scaffolding, the half-torn street art stickers, the discarded pizza boxes and the bags of rubbish, a piece that really is so alive that it kind of emphasises how a very formal hang in a formal gallery environment can almost neuter a street artist. But then Cochran isn’t just a street artist, his work surely deserves to be viewed away from the energy of the street, he deserves the formality of a conventional gallery hang, he deserves some polite wine served with a smile on a tray as you view doesn’t he? He deserves to be viewed “properly” in a gallery. 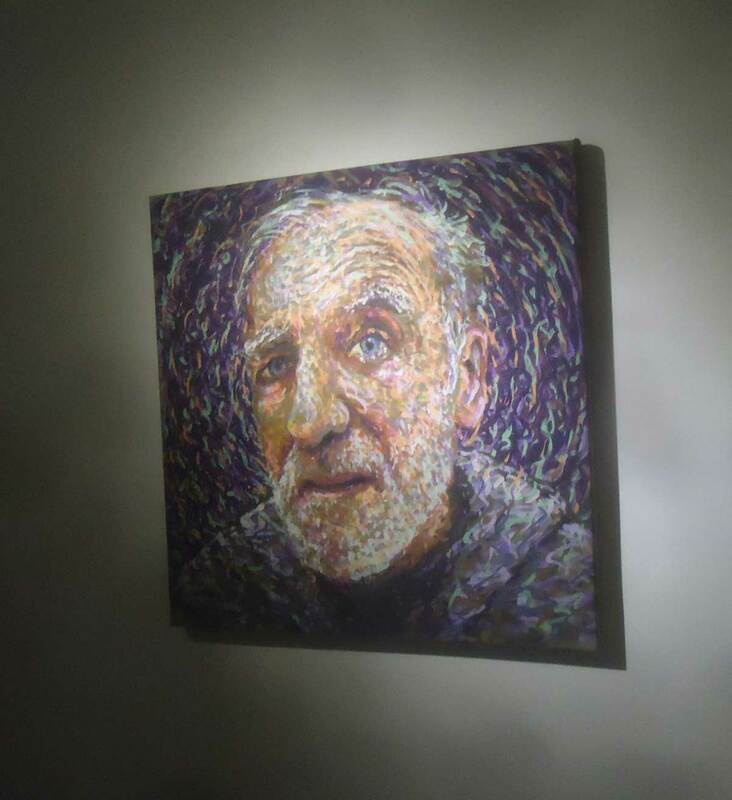 There’s some impressive work in here on the walls of both floors of Lollipop, not everything works, but there is some strong impressive work, Jimmy’s colour is a strong, those impressionists again, the use of light. 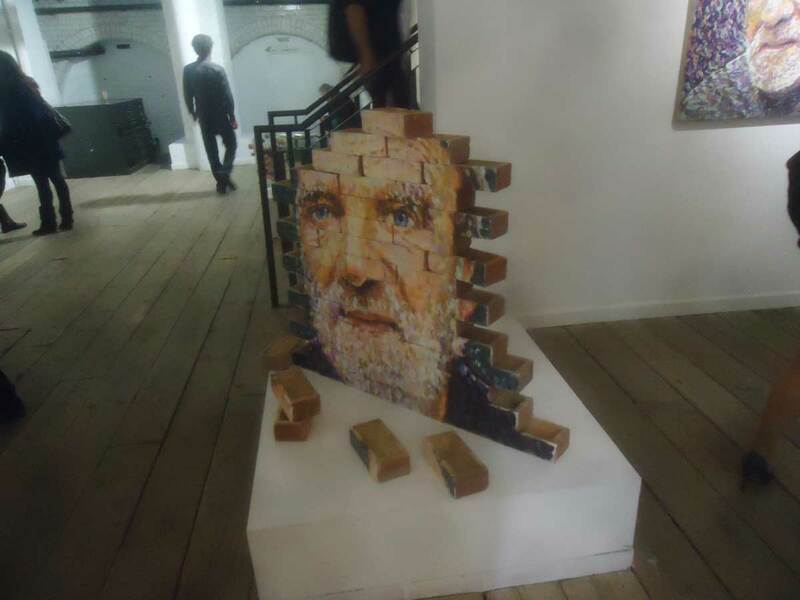 There’s some strong work here – the piece on the bricks, the hope beacon that is neon heart – really it’s the “formal” portraits, the stylised contemporary portraiture, the collection of large canvas pieces, faces from now – portraiture updated for the age of the selfie (and people were taking selfies with the portraits in the background last night). 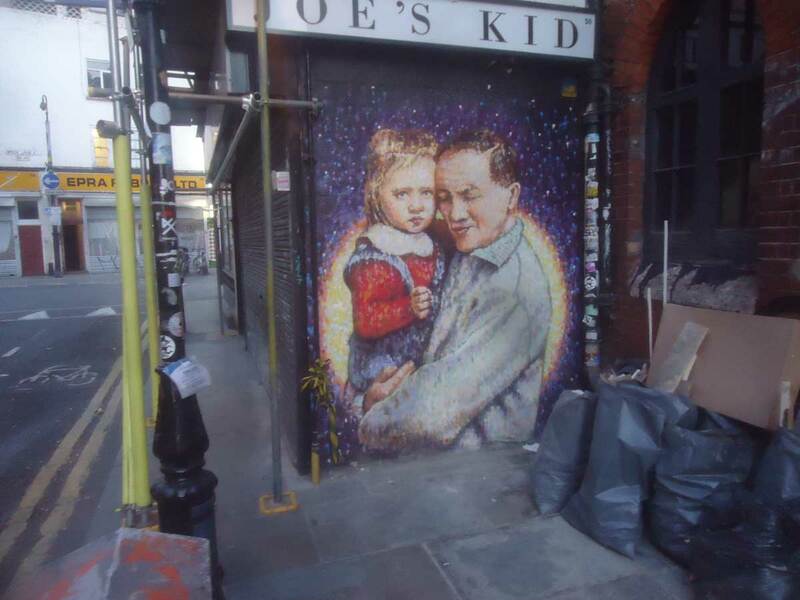 The piece down Fashion Street, Joe’s Kid, really is one of Jimmy C’s best pieces of work, it would be a stand out piece if he had painted it on canvas and hung it in this show on the formal walls of the gallery alongside any of tonight’s Cochran pieces. ATOMISED is on at the LOLLIPOP GALLERY, 58 Commercial Street, London, E1 6LT right now, The Show runs until October First Thursday. ORGAN THING: Mad C, Jimmy C, Sarah S and hey Al, what about those forgotten women of pop art?